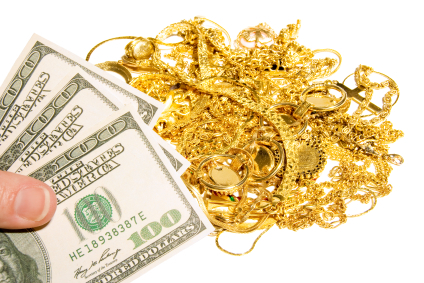 Have you considered selling your gold jewelry but not sure who to sell gold to? vendors and Craig's list buyers do not operate in a licensed manner. one master weighing and then offered a lump sum for all. Check back for other tips for selling gold. to put us on your shopping list for the most competitive bid. It is a great time to sell gold. Although gold is not at its all-time high, it is still high. And that means a little bit of gold can be a lot of money. When selling gold jewelry, the gold buyer will separate your items by karat, which tends to be 10k, 14k, 18k and 21k. Once the jewelry has been checked for purity, the gold buyer will weigh up the different karats and then give a price for each type. It is usually weighed in grams (g) or pennyweights (dwt). When you see the price of gold on tv – that is quoting 24k (pure gold) for an ounce. You will not get paid this amount unless you have pure gold in coin or bullion form. Jewelry is not pure and must be refined. You will be paid on the purity and less smelting fees. Shop around to get the best quote as each gold buyer has their own pay-out formula. If you live in Palm Beach County and plan to sell gold jewelry, be sure to put the Lake Worth Gold Mine on your shopping list for the most competitive bid. Cash for Gold. A scam or not? 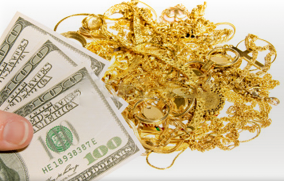 With so many “Cash for Gold” stores popping up, many people are asking if it is a scam. Gold is trading at high prices right now, and the economy is still in recovery. You can create your own stimulus package by taking in old gold, broken, or outdated jewelry that is sitting in a drawer and turn it into cash. That is not a scam. If you plan on selling gold, it is important that you sell to the right company. There are many online companies that require you to mail-in your gold and then wait for a payment by check. Not your fastest option. You can also try a Pawn Shop. A Pawn is in the resale and loan business so chances are, this will not be your best offer. Check out a local gold buyer and get a few quotes. Most likely this will be your best offer and you can receive your cash for gold payment immediately. Do you have gold jewelry that you do not wear anymore – broken or outdated? It’s a great time to sell gold. Gold prices are still high and a little bit of gold will bring a lot of cash! Instead of that scrap gold sitting in your drawer, turn it in and get cash for gold. The value of your gold is determined by sorting the karat – such as 10k, 14k, and 18k and then weighed. An offer is made by karat (which is the purity level). Selling gold jewelry is a great option if you need cash or just spring cleaning your jewelry box from those single earrings, broken chains, and out-of-fashion items.